Quarter-plate tintype by an anonymous photographer of Henry A. Wiggins of the 10th Massachusetts Infantry from the Paul Russinoff collection. Guest editorial by Harry Roach. The founder of Military Images, Roach served as editor from 1979 to 2000. Feedback from the previous issue includes the identification of a column of troops as members of the 22nd U.S. Infantry on a practice march in the Yellowstone River Valley near Fort Keogh, Mont., in 1896. “Myths That Can Be Told and Touched” is a review of Smithsonian Civil War, edited by Neil Kagan and Stephen G. Hyslop. If a Union soldier’s photo album embodied the visual record of his Civil War experience, the album’s heart and soul was the image of the colors under which he and his comrades fought. This selection of distinctive cartes de visite comes from the collection of Rick Carlile. An Epic Battle for the Yorktown Cup by Nicholas P. Ciotola (pp. 28-31). Jerseymen led by Civil War veterans took home the coveted prize at the 1881 centennial competition. The honor was presented by Maj. Gen. Winfield Scott Hancock, who had been asked to select the unit that showed the “best military appearance,” and present its members with an ornate, sterling silver vase. Inscribing the names, rank and regiment on a portrait photo was a common practice used by a Civil War soldier to record his identity. But for a tiny percentage of soldiers, an autograph was unnecessary—their personalized accouterments performed the same function. A selection of images of soldiers with names added to caps, canteens and other equipment. A series of photographs commissioned by German-American inventor Dietrerick W. Kolbe in 1864 made the case for an innovative prosthetic design. The images, all cartes de visite, showed how the leather and steel arms and hands were technical marvels—and they helped Union veteran amputees to a better life. Life Behind the Iron Shield by Shelby Crouse (pp. 40-42). Union Navy officer William Frederick Keeler recalls his experiences the good, bad and ugly experiences he endured as paymaster on the famed ironclad Monitor. In this issue, titled “In Forage cap or kepi? (Maybe fatigue cap would be better),” West Point curator Mike McAfee explains the origins of the terms, and suggests their proper usage. Featured in this issue is a quarter-plate ambrotype of Lt. Vincent Marmaduke attired in the uniform of the Hamtramck Guards, a local militia company in Shepherdstown, Va. 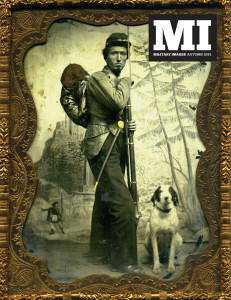 Images submitted by the MI audience in this issue includes a Southern patriot with a pleated shirt and Enfield musket, a sixth-plate tintype of Jacob R. Brinker of the 104th Pennsylvania Infantry, and a ninth-plate tintype of a woman dressed in the uniform of a Union private. Stragglers appears regularly in MI. This issue features a carte de visite of a Union soldier with his feet propped up on a chair.